The boats full of fruit were beautiful. It was really colorful despite the impending rainstorm. 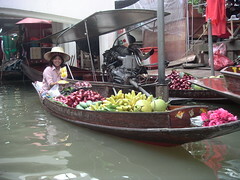 As soon as it started raining the vendors frantically covered their goods and our driver paddled us back to the dock. Oh well, at least I was able to grab a quick plate of noodles before we left for the gem factory. Hey Bucky, it's Suzanne, girl you met on the tour today. Want to go for a beer later to celebrate your last night in Thailand? On the off chance you get this in time, my phone number's +61401234073. I'm pretty sure it'll work, though I can't call or sms anyone - go figure! Anyway, if I don't catch ya, my email is muumuu_82@yahoo.com.au. (Don't ask - I've had it since high school). Pics look great.....sounds like an amazing time you had. I'll have to hear all about it over a few cold ones. Talk to you soon.